17-inch steel wheels, automatic headlights, power-folding mirrors, keyless entry, rear privacy glass, full power accessories, air-conditioning, cruise control, a tilt-and-telescoping steering wheel, a 60/40-split and reclining second-row seat, a rearview camera, Bluetooth phone and audio connectivity and a six-speaker sound system with a 6.1-inch touchscreen, a CD player, an auxiliary audio jack and an iPod/USB audio interface. 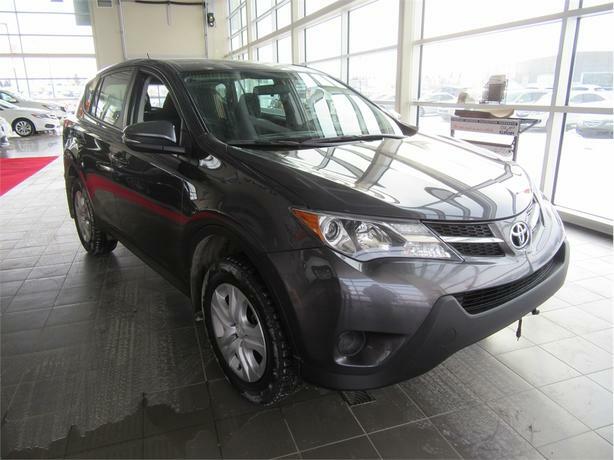 If you're shopping for a small crossover that will get you from A to B and beyond, this RAV4 has a great combination of desirable features and passenger space. Acura Centre of Saskatoon is proud to have one of the highest customer satisfaction ratings across the industry! When you buy from the Acura Centre you not only get a Certified Pre-Owned vehicle, but you also get access to state-of-the-art service facilities and an award winning 5-star sales and service team! All of our pre-owned certified vehicles come with a 92-Point Mechanical Inspection, Carproof vehicle history report and a 7 Day/1,000 KM Exchange Policy. We carry premium used vehicles at prices that are competitive in today's market. If you don't find what you're looking for in our inventory, just ask, and we'll do our best to fulfill your needs. At Acura Centre we value our return customers and we're always looking to earn new business. Located in the Stonebridge area at 819 Melville St., please stop in any time and chat with our friendly staff members.